Amptown System Company and Salzbrenner Media in a working community, ASC for the described media technology. Sound reinforcement in the Linden Opera is ensured by d&b audiotechnik speakers which are controlled by system-specific final stages with integrated DSP controller and 40 Meyer Sound MM-10-XP and 120 Meyer Sound MM-4 miniature wide-range speakers in the passive version. Mounted on mobile tripods, proven Meyer Sound UPAs can be used in any number of selected spots to create various additional reinforced sound scenarios. Virtually out of sight 40 d&b E12 2-way high-power speakers are integrated in the lighting hoists, the hall ceiling, the proscenium bridge, and in the reverberant gallery. Four d&b Yi10P build-in speakers and two E8 speakers are accommodated in the proscenium arches behind the painted sound-permeable fabric cover. The centre cluster involves six d&b T10 speakers. Above the proscenium, the foremost area of the opera stage, 12 d&b T-SUBs ensure that the bass is heard and felt everywhere in the hall. Amptown System Company installed a pounding bass Vi7p speaker with two V-SUBs to the right and left to reinforce sound feeds from the backstage area. The Surround System A 3D audio system made by Astro Spatial Audio is used to create special scenic effects which are additionally supported by two built-in SARA II Premium rendering engines. These engines are incorporated in the Nexus audio routing system via 128 MADI channels respectively and are available to all of the speakers for sound reproduction. System control is implemented via 128 vertical speaker groups (surround channels). This equipment enables the sound engineer to direct any additional sound effects opera performances may require to wherever they are needed in interactive mode, e.g. to stage a choir using the audio system and involving the hall as a third dimension. In this way sound will work as a medium to draw listeners into the performance. To generate an all-encompassing experience both light and video systems may additionally be used. For the Linden Opera rehearsal stages Amptown System Company supplied nine mobile media racks equipped with an IN 1608 Extron audio/video routing matrix as a AV signal selector switch for Blu-Ray, CD and PC source feeds, and wireless microphones. If the racks are connected to the Opera’s own IT network, access to in-house recordings is possible. For such purposes the Berlin State Opera was provided with three Extron SMP 351 H.264 streaming media processors which ensure real-time streaming of the camera signals and allow for the production of recordings intended for later use. 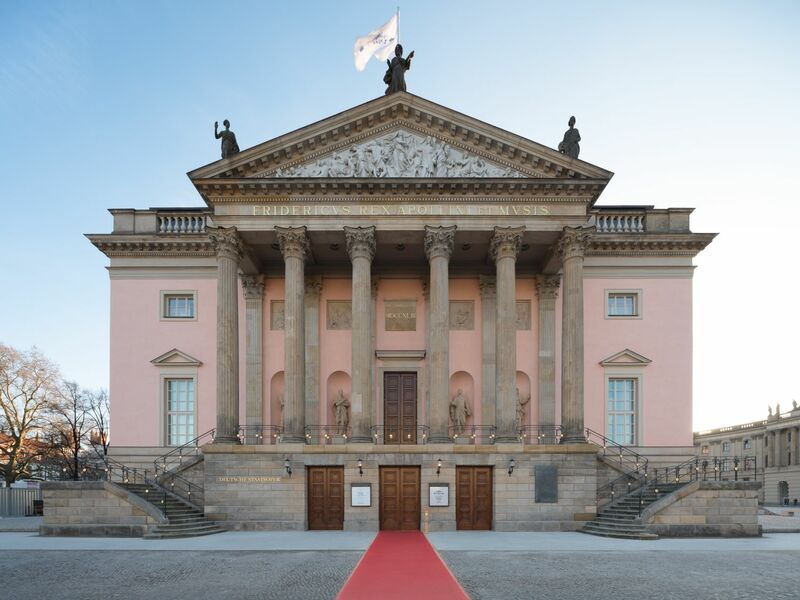 To ensure clear sound and stable transmission the Unter den Linden State Opera was fitted out with a digital wireless radio system with 34 channels from the new Axient digital series by Shure that will be upgraded to the controllable ADX transmitter variant in the near future. Operational safety being a crucial requirement of the Lindenoper specifications, the cutting-edge wireless system by Shure was found to be the best choice as it actively ensures reliable signal quality and provides extensive signal coverage within an environment characterized by a multitude of RF transmitters. What is more, the Axial Digital System has introduced a couple of new technological features to the wireless microphone market. For instance the system is capable of scanning the entire RF environment with a “spectrum manager” and to automatically compute an optimal frequency setup. Afterwards this setup can be directly transmitted to the receivers and transmitters in a simple action, with the ADX types even allowing for real-time transmission via a separate RF channel. Disturbances can thus be eliminated any time – even while a performance is going on. Setups varying as productions change are simply saved and communicated to the transmitters when they are needed. Other innovations the Axient Digital System comes up with are e.g. quadversity, an identical switching bandwidth (166 MHz) of receivers AND transmitters, network-monitored desktop chargers for handheld and pocket transmitters (lithium-ion batteries), and a digital mini pocket transmitter with integrated self-tuning antennas. The new radio transmission equipment for the opera house includes 34 pocket and 8 handheld transmitters from the Axient Digital series. An in-ear system from the proven PSM 900/1000 series by Shure with 40 receivers is complementing the equipment. To develop sustainable technical solutions regarding HF transmission was one of the particular challenges of this project. The various radio systems i.e. wireless microphones, wireless intercom and in-ear monitoring are used in different parts of the building some of which are far apart from each other. For all that uniform radio coverage must be ensured throughout the whole area. The wireless BTR-800 full-duplex intercom system produced by RTS even depends on a bidirectional infrastructure for consistent coverage. Amptown System Company installed a fibre-based HF distribution system made by The Wireless Works in the Unter den Linden Opera which provides for all of the HF signals to be transmitted to the various areas without losses and ensures that this crucial requirement is met. High frequency connection of the stage and the auditorium to the two building services equipment centres is implemented via an optic fibre infrastructure. The same applies to the foyer, the Apollo hall – venue for readings and small chamber concerts – and the walkways for the staff. The open system is an important feature of Amptown System Company system integration involving distributed remote units which operate bi-directionally radiating the HF signals to the individual parts of the building and receiving them from the locations involved. Video transmission of the conductor in opera and concert houses is always a particular challenge as transmission from the orchestra pit to the backstage areas or the auditorium should ideally be latency-free. The image of several Panasonic AW-HE 130 cameras which are connected with suitable LWL converters via an Extron HD-SDI FOX matrix is displayed on Sony LCD and OLED monitors. It is a specific feature of the OLED technology and a complete novelty that when a scene calls for blacking out the black will indeed be absolute in contrast to other systems where the monitors will show a dark grey glow which still faintly illuminates hall and stage. Apart from the camera signals from the orchestra pit and the long shot from the hall, scenic players manufactured by Green Hippo are connected to the Extron crossbar as well. These distribute the image along with the embedded sound throughout the house via permanent or patchable fibre optic connections.